Bihar Lok Manch team along with Delhi, Uttarakhand, Gujarat and Maharashtra team visited Vidyadham Samiti at Atarra, UP for two days on 5th and 6th February 2019. The purpose of the visit was to generate an exchange of experience and good practice between the organizations. It was to enable participants to interact with and learn from each other, allowing them to view practical examples of successful integration of sustainable practices in development works. First day Mr. Raja Bhaiya Founder of Vidyadham Samiti briefed the two days programme schedule of exposure visit and also explained the initiation and purpose of Chingari Sangathan. According to him over two thousand members in twenty five villages have been working under Chingari Sangathan. We visited two villages on first day of the visit. 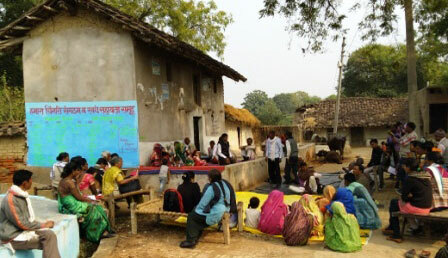 First village named Jhandupurwa was approximately 20 Kilometers away from head office. 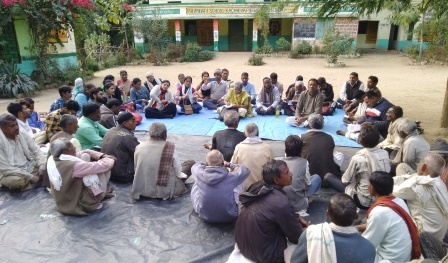 Village meeting began with few folk songs performed by local musical group. (This is general way of crowd pulling in all implementing villages). 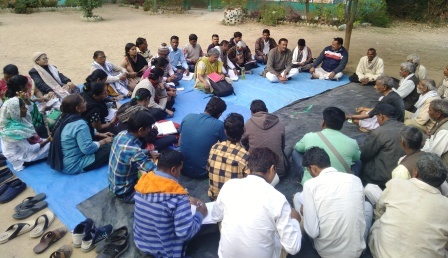 Lok Manch team interacted with local community (Dalit) on literacy, situation of women empowerment, livelihood opportunities, caste system, poverty, purdah system (parda pratha) and access of government schemes. Local community shared their experiences of Chingari Sangathan. One of the significant observations was purdah system still prevailing and community is not active in accessing government schemes. Apparently Lok Manch participants also felt that organization has some credibility on community for mass awareness programmes and demonstration on several issues. Less participation of women in meeting was one of major concern, although they shared that women do participate in major activities. In second village Kachiapurwa around 20 villages (all males) participated in joint meeting. In this meeting Chingari sangathan leader Mr. Kallu explained the local social, economical and cultural scenario. Mostly Dalit community is still overpowered by the landlords and upper caste. Villagers also explained that Anna pratha. This system allows landlords to forcefully give their milkless cattle to Dalits for rest of cattle's life and Dalit family have to take care of these cattle’s. Day two Vidyadham Samiti organized a function to showcase their activities and achievements done so far. Sub-divisional Magistrate, Municipal Corporation Chairman, DDM NABARD, Local social workers, journalist etc. were present in the meeting. Atarra block of Banda district of Uttar Pradesh is socially and economically backward area. So it has greater opportunity for improvisation by development works.